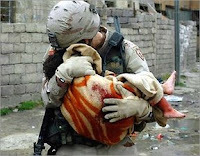 As I looked at this image it occurred to me that it doesn’t really matter if you are for the war or against it. Human hearts are being broken at the sight of the losses. We rarely think about the children who are being torn from familiar places and even from their physical bodies…and the mothers and fathers, soldiers and fighters who bear witness to it. This picture captures a glimpse of our humanity– the language of love, given to us from God– pouring gently from one human to another. It caused me to pause this morning and be truly grateful for everything we have been given. This image was sent to me in an e-mail with no reference to it’s source.